The Saint-Sulpice church in Paris struck by a fire on March 17, 2019. 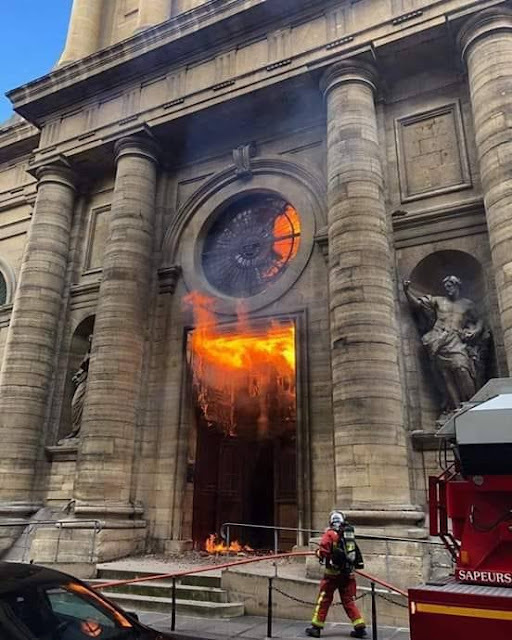 The Saint-Sulpice church, near the French capital, was evacuated due to a fire. The firefighters overcame the disaster, whose causes are not yet known. On March 17, early in the afternoon, in Paris, the firefighters were sent to the church of Saint-Sulpice, where the fire broke out. The place of worship was evacuated. The causes of the fire are still unknown. Images taken from outside show the intervention of fire fighters with fire hoses, as well as plumes of dark smoke rising from the doors of the building. The fire seems to have started at the entrance to the place of worship around 13:40, according to Le Parisien. No people were hurt during the fire.